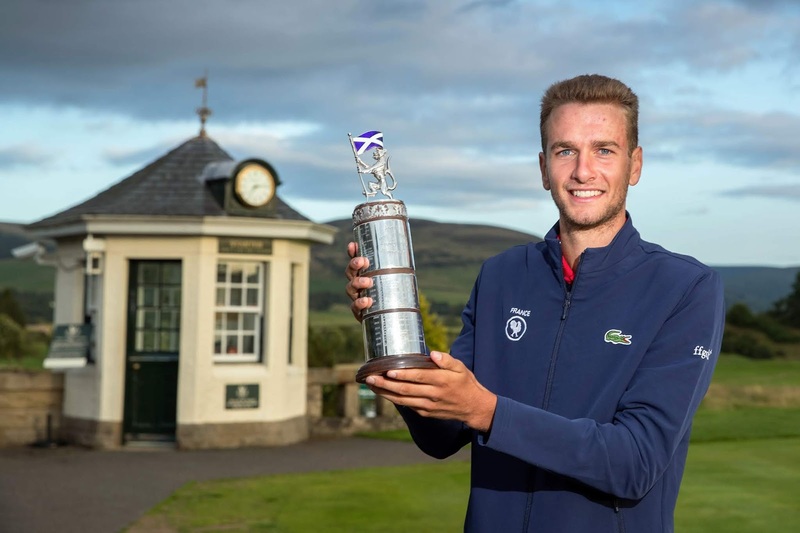 Six-foot five-inch Frenchman, Victor Veyret, reached new heights at Gleneagles after storming to victory in the Carrick Neill Scottish Men’s Open Championship. Veyret, the only player to card all four rounds in the sixties, finished the week on 12-under-par and six shots clear of runner-up Conor Purcell from Ireland. The victory means Veyret is the third Frenchman in nine years to win the Scottish Men’s Open Championship and his name will sit proudly alongside European Tour player Romain Wattel, who won the title in 2010 at Glasgow Gailes and 2012 winner Paul Barjon, who plays on the PGA Tour in Canada. After his victory, the delighted Frenchman said: “It was a very good day, this is the biggest win of my career. I won the Italian Amateur Championship in 2016, but this is bigger. “On the first day my iron play was great, but over the full week I holed a lot of putts, the greens were perfect. When asked about his future, the 21-year old confirmed he will, in fact, be heading to Le Golf National next month for the Ryder Cup. However for this tournament at least, he will be volunteering inside the ropes as a scoreboard carrier. Perhaps in the future, Veyret will go on to live out his “dream” and represent Team Europe in the Ryder Cup. Kilmarnock Barassie’s Euan Walker was the top Scottish performer this week, finishing in sole possession of third place on five-under-par. “It was a pretty good week for me, particularly the first two rounds where I was good from tee to green. However, unfortunately, that deteriorated throughout the day today. “Victor played really well today and I was just always too far behind. I didn’t make enough birdies to make a charge. Next up for Walker is the World Amateur Team Championships in Ireland (5-8 September) as part of Scotland’s three-man team, along with Ryan Lumsden and Sandy Scott. “I’m looking forward to the Eisenhower Trophy, it will be the biggest event that I have ever played in. It’s an honour to represent Scotland and I hope I can play similarly to how I played this week. Elsewhere on the home front, there were top-15 finished for Irvine’s Stuart Easton (T4), Greg Dalziel (12th) of Airdrie and Scottish Amateur Champion Euan McIntosh (T15). Carrick Neill is recognised in the market as one of the UK’s leading providers of golf insurance for both golf clubs and golfers alike. The company has a long association with Scottish Golf and became official sponsors of the Scottish Men’s Open Championship in 2010.